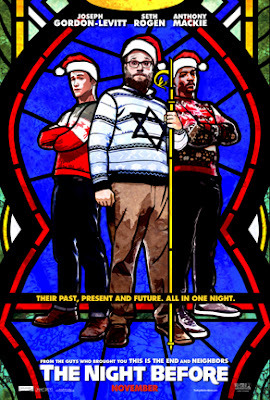 The Night Before comedy movie from Sony Pictures, opening in theaters November 25, 2015, looks like it will be hilarious. Starring Joseph Gordon-Levitt (Ethan), Seth Rogen (Isaac) and Anthony Mackie (Chris), this is the story of friends since childhood who, despite religious and cultural differences, for the past ten years have been enjoying an annual Christmas Eve reunion together. Now, though the guys -- wearing ugly holiday sweaters and all -- want to keep the tradition going, they suddenly find themselves all grown up. Realizing they need to change things up a bit, they set out to find the Nutcracka Ball - the Holy Grail of Christmas parties. With ultra-funny Seth Rogen in the role of a nice Jewish boy, what can go wrong? Apparently plenty, which is why I think this upcoming feature film will have you laughing from start to end. FTC Disclosure: Images provided by Sony Pictures. MommyBlogExpert is not receiving any payment or other compensation associated with this particular post. See complete FTC disclosure information that appears at the bottom of MommyBlogExpert's main page and at the bottom of every individual post on this blog, including this one.